Having spurned the opportunity to move within touching distance of a second successive appearance on Africa’s grandest footballing stage, Cape Verde will be targeting completing that assignment on Wednesday night when Mozambique visit Praia. The Mambas themselves however harbour genuine aspirations of securing a first AFCON birth in three attempts – repeating their points total from the group’s first three rounds of fixtures would guarantee an unexpected ticket to Morocco. Having stumbled to Wednesday night’s opposition in Matola just three days ago – strikes from Kito and Reginaldo securing a momentous 2-0 victory – Cape Verde will be more than aware of the dangers presented by Mozambique. The Blue Shark’s stumble in Matola came somewhat out of the blue, with the 2013 AFCON quarter-finalists – an accomplishment all the more remarkable considering South Africa 2013 represented their tournament debut – having begun their bid for qualification with consecutive victories. To vindicate their recent upsurge, Saturday’s setback signified only Cape Verde’s second loss in ten competitive fixtures. In that defeat the absences of Ryan Mendes and Heldon, pivotal clogs to Cape Verdean arsenal, acted as a substantial equaliser to a fixture which on first glance resembled a relative mismatch. Should the influential duo again miss out, the task of breaking down a backline who have thus far conceded just once in three group fixtures will be far from straightforward. 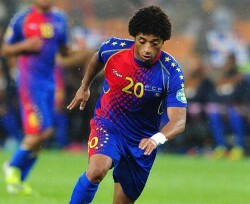 Nonetheless, in contrast to their opponents the Islanders can still boast a squad packed with European talent and accounting for the hosts traditional dominance in Praia – Cape Verde have lost just once in six years on home soil – workmanlike Mozambique will enter tonight’s contest as firm underdogs. A generous group draw has benefited both nations, with Cape Verde’s the assignment on first glance seemingly presenting minimal demons for Rui Águas’ side. On the other side of the coin the allocation has offered Mozambique, who have only navigated their way into the groups via knockout wins over both Tanzania and South Sudan, an unforeseen qualification opportunity, one which has only been heightened by Niger and Zambia’s struggles. For Cape Verde victory would secure qualification and thus cement an upsurge which has seen the blue sharks rise from minnows to feared opposition in half a decade, at the same time should Mozambique avoid defeat an unanticipated placing in Morocco would be within their grasp.